What is a Podwit to do in this crazy, maddening, evolving (for better or for worse) world?! Do the classics in film (or any art for that matter) age like a fine wine or do they deserve to be torn down and placed against what is now called a “classic” by today’s critics? Also, do franchises suffer or lose their “heart” after their creator dies, as in the case of Jim Henson’s Muppets or Ian Fleming’s James Bond? And did the Doors guitarist Robbie Krieger take a shot at his former bandmate, drummer John Densmore, when discussing the passing of their colleague, keyboardist Ray Manzarek? It’s all too much for us to handle in one sitting!!! 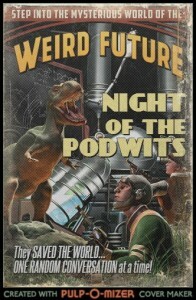 Come have a listen and decide for yourself in another fuel-injected dose of the Podwits Podcast!